The Town of Sahuarita is lowering Sahuarita Lake water levels to properly inspect, evaluate and perform lake maintenance as needed. For any questions or further information, please contact Brian De Breceny, Parks Manager at: bdebreceny@ci.sahuarita.az.us. The Sahuarita Lake spring season final catfish stocking scheduled for June 10-15 was cancelled due to low lake water levels. Sahuarita anglers are advised that extra loads of catfish will be included in the June 10-15 deliveries to Kennedy Lake and Lakeside Lake (Chuck Ford Lakeside Park) in Tucson. Another nearby Urban Fishing Program water, Silverbell Lake, will get a regular catfish stocking. There are no further scheduled fish deliveries to any of the 21 Urban Fishing waters, including Sahuarita Lake, for the months of July, August and early September. Fish stockings at Urban Fishing Program waters will resume on a regular basis in the fall when catfish stockings start the week of September 16-21. Fall stockings at Sahuarita Lake are contingent on lake water levels returning to normal. Finally, here's a rundown of Saturday's free fishing events, which the Arizona Game and Fish Department has been sponsoring to give people the opportunity to try out this fun, family-oriented pastime. Loaner fishing rods, bait and instruction are provided for free at most of these venues. • Mormon Lake Lodge Pond (about 20 miles southeast of Flagstaff), 10 a.m. to 3 p.m. Free fishing will be offered at the trout pond as part of the Mormon Lake Lodge Outdoor Festival. Fishing will be conducted the Arizona Game and Fish Department Flagstaff region, and Northern Arizona Flycasters. There will be fly casting and fly tying, along with tips from knowledgeable anglers. The festival will have more than 50 exhibitors representing sportsmen's and conservation groups, government agencies, and outdoor recreation organizations. For more information, contact Game and Fish Sportfishing Education Coordinator Doug Thornburg at (623) 236-7240 or Mormon Lake Lodge at (928) 354-2227. • Goldwater Lake (Prescott), 9 a.m. to 1 p.m. The Arizona Game and Fish Department Kingman region and the City of Prescott are planning a day of free fishing for the whole family. Staff will be on hand to assist anglers. Bait will be provided and loaner rods will be available. For more information, please call the Arizona Game and Fish Department Kingman office at (928) 692-7700. • Parker Canyon Lake (near Elgin), 9 a.m. to 1 p.m. The free fishing event will be part of the National Get Outdoors Day event held at Parker Canyon Lake by the Arizona Game and Fish Department, the USDA Forest Service, and other agencies and conservation groups. 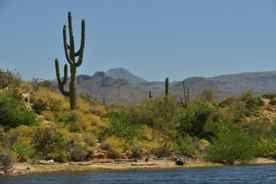 The elevation of Parker Canyon Lake is 5,400 feet, so the weather will be several degrees cooler than Tucson. Camping and boat rentals are available for a fee at Parker Canyon Lake; call the store for more information at (520) 455-5847. For more information, contact Rebecca Hodgeson, Fire Prevention Specialist, USDA Forest Service, Sierra Vista Ranger District, at (520) 378-0311. • Lake Pleasant Regional Park (northwest of Phoenix), 7 a.m. to 1 p.m. Free fishing will be part of the "Lake Pleasant Adventure Day," where attendees will also be offered various hands-on learning opportunities for scuba diving, boating, kayaking, stand-up paddle boarding, and other forms of recreation. Staff from the Arizona Game and Fish Department and Lake Pleasant Regional Park will have loaner rods and reels and a limited supply of bait available. To get to Lake Pleasant, take Highway 74 to Castle Hot Springs Road. Participants will need to pay $6 per vehicle entry fee at the main park entrance, and then follow the signs that say "Adventure Day" to the 10-Lane Boat Ramp. For more information, please contact Terry Gerber, Interpretive Ranger, Lake Pleasant Regional Park, (602) 372-7460 x 202. • D'Ambro Ponds (near Kingman), 7 a.m. to 1 p.m. Free fishing at this great family event conducted by the Arizona Game and Fish Department, Mohave County Sheriff's Office, and D'Ambro Pond. Free hot dogs and drinks will be provided. The event is free for children between the ages of 5 and 16; donations to D'Ambro Pond are appreciated. Pre-registration is requested; to register, please stop by the Arizona Game and Fish Kingman regional office (5325 N. Stockton Hill Road) between 9 a.m. and 2 p.m. on Saturday, June 1. For more information, contact the Game and Fish Kingman regional office at (928) 692-7700. • Dunton Ranch (near Kingman), 7 a.m. to 11 a.m. Free fishing at this great family event conducted by the Kingman Elk's lodge, Mohave sportsman's club, and Arizona Game and Fish Department. Free hot dogs and drinks will be provided. The event is free for children between the ages of 5 and 16. Pre-registration is requested; to register, please stop by Kingman Regional Medical Center's kids day on June 1st, or the Arizona Game and Fish Departments Kingman regional office (5325 N. Stockton Hill Road) during normal business hours before June 1st. For more information, contact the Game and Fish Kingman regional office at (928) 692-7700.